Home Pharmacogn J, Vol 9, Issue 6, Nov-Dec, 2017 Characterization and Distribution of Flavonoids from Flowers in Different Horticultural Types of Begonia. Department of Medicine, Faculty of Medicine, University Ferhat Abbas, Sétif, ALGERIA. Laboratory of Phytochemistry, University Claude Bernard-Lyon I, Villeurbanne, FRANCE. University Frères Mentouri Constantine 1, Constantine, ALGERIA. The begonias are ornamental plants known by the varied forms and colors of their flowers, as well as their decorative foliage. This study attempts to characterize the flavonoids isolated from flower extracts of different horticultural cultivars of the genus Begonia. The compounds of the ethyl acetate and aqueous extracts were separated by chromatographic methods and identified by UV spectra and chemical techniques. The analysis allowed the characterization of flavonoids belonging to flavonol types in the free aglycones and glycoside forms of kaempferol and quercetin. On the other hand, fingerprinting analysis and quantification of major flavonoids of 184 cultivars were performed by high-performance liquid chromatography (HPLC). Among twenty five (25) components which were detected and separated: ten were corresponding to quercetin 3-O-glucosyl-rhamnoside (Rt=23.5), quercetin 3-O-glucoside (Rt=25), kaempferol 3-O-glucosyl-rhamnoside and its acylated derivative (Rt=32), kaempferol 3-O-glucoside (Rt=33), quercetin 3-O-p.coumaroyl-diglucoside (Rt=37), quercetin 3-O-P.coumaroyl-glucoside (Rt=40.5), quercetin (Rt=41.5), kaempferol and its acylated derivative (Rt=47). Only non-acylated glycosides of quercetin and kaempferol contributed to chemical variations among different cultivars based on the results of PCA. The genus Begonia is very heterogeneous and it is possible to distinguish several chemotypes whose differences rely on the complementarities between the metabolic pathways involved in the biosynthesis of glycosides of quercetin and kaempferol. The phytochemical study was conducted on the flower extracts of different horticultural types of Begonia and leads to the isolation of 10 compounds corresponding to kaempferol and quercetin aglycones or glycosides (mono and diglycoside), acylated and non-acylated components. Six of these molecules are cited for the first time in this genus. On the other hand, the evaluation of the flavonol composition in different cultivars showed that glycosides (mono and diglycoside) of kaempferol and quercetin are the main compounds contributing in varietal discrimination. The genus Begonia is very heterogeneous and it is possible to distinguish several chemotypes within the cultivars of the same type as between distinct types. These differences rely on the complementarities between the metabolic pathways involved in the biosynthesis of glycosides of quercetin and kaempferol. The study was conducted on floral material of 7 different horticultural types: bamboo Begonia, Begonia elatior,tuberous Begonia, bushy Begonia, frutescent Begonia, rhizomatous Begonia and failing Begonia. The major of these cultivars were maintained by vegetative propagation, cultivated in greenhouse at a temperature of 22°C and humidity of 75%. The flowers of these cultivars were harvested at a stage corresponding to three opening days floral and stored in the freezer. The petals of the flowers were collected at the laboratory of Phytochemistry of the University Claude Bernard (Lyon I), France. - The first extraction concerned 184 cultivars belonging to different horticultural types of Begonia. 20 petals of fresh flowers of each accession were macerated in 50 ml of methanol-ethanol (1:1) at 80°C for 30 min. The extract was recovered by filtration, evaporated to dryness under reduced pressure at 40 °C and then dissolved in 5 ml of methanol. These extracts were submitted to high performance liquid chromatography (HPLC). - The second extraction was carried out on a mixture of frozen flowers from different horticultural types of Begonia. The floral material was extracted by maceration in methanol-ethanol (1:1), under reflux at 80°C for 30 min.16 The mixture was then filtered and evaporated to dryness under reduced pressure. The dry residue was treated with 200 ml of boiling distilled water to dissolve the flavonoids. This solution was left to settle in the refrigerator for 24h and then filtered through Whatman filter paper. Phenolic compounds of this filtrate were extracted three times with ethyl acetate. The organic and aqueous phases (E and H) obtained by this treatment were evaporated to dryness under reduced and then dissolved respectively with methanol and MAW (methanol/acetic acid/water, 4:1:5). The extracts of Begonia flowers were fractionated by column chromatography using polyamide SC6 (Mackerey and Nagel). For the organic phase (E), the elution was started with toluene and decreasing the polarity in 5% with methanol to 100% methanol to yield 8 fractions (E1-E8). In another hand, the aqueous phase (H) was eluted with a gradient of water/methanol with increasing percentage of methanol and yields 3 fractions (H1-H3). The progress of development was monitored with UV lamp. Fractions collected from column chromatography were submitted to preparative thin layer chromatography in order to estimate their phenolic composition and separate their components. This assay was used to identify and quantify the levels of flavonoid in the different types of Begonia. For Begonia flavonoids, separation was carried out using a Kontron HPLC system 600 with diode array detector and a reverse phase column C18 (30 cm in length, 5 µm particle size) proceeded by a C18 guard column which retain the impurities and coupled to a photodiode array detector. The mobile phase consisted of two solvents; solvent A: water-acetonitrile-acetic acid (90:10:4) and solvent B: water-acetonitrile-acetic acid (80:20:4). Qualitative analysis was made in step gradient mode, with 2% to 40% of solvent B/solvent A in 60 min and 40% to 90% in 10min, at a flow-rate of 1 ml/ min. 20 μl of extract of each cultivar or isolated flavonoids from Begonia flowers were injected and the acquisition of data was performed at 340 nm. 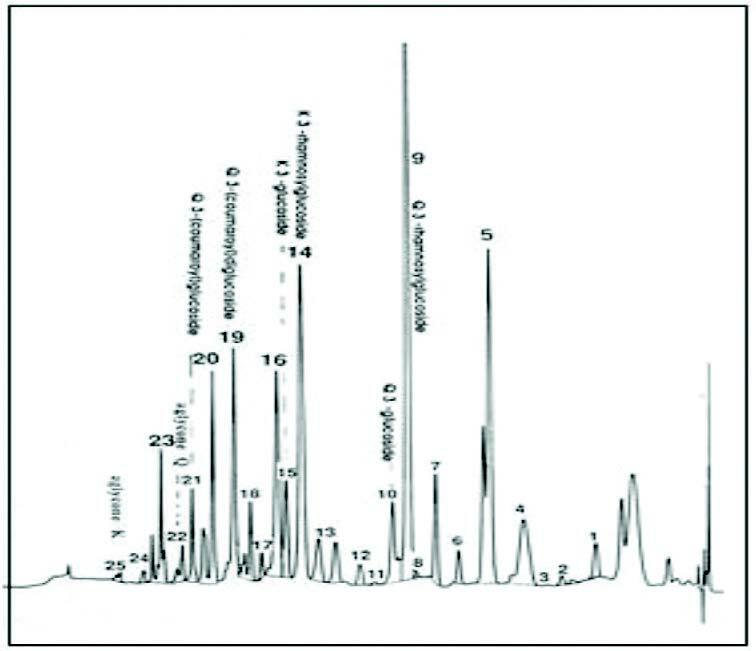 The chromatographic profiles were recorded by identifying the peaks according to their retention time and each peak was quantified by its area expressed in a percentage. The method consisted of heating the component which was suspected to be a glycoside, 15 to 120 min with HCl (2N) in a water bath and the mixture was then cooled. The aglycone extracted twice with ethyl ether, was identified by UV-spectroscopy and co-chromatography with authentic standards.19 The sugars remain in the aqueous phase, were identified by co-chromatography with standards (glucose, xylose, rhamnose, galactose and arabinose) on silica gel 60 F254 plates using acetone/water (90:10) as mobile phase. The revelation of the sugars is done by spraying the plates with aniline malonate, then heating in an oven at 100°C. The acylated flavonoid was mixed with solution of potassium hydroxide KOH (1N) in 10 % of methanol during 30 min under nitrogen atmosphere. After acidification to pH 3, the phenolic acid was extracted at first with ether and the aglycone by ethyl acetate secondly.19 The phenolic acid and the aglycone were identified by UV spectroscopic analysis and co-chromatography with authentic standards. The released sugars underwent the same processing described previously in the acid hydrolysis. The HPLC data were subjected to principal component analysis (PCA) by ADE-3.1: Hyper-Card© Stacks and QuickBasic Microsoft©; UCB Lyon 1, France. The UV spectra and the data of acid hydrolysis are shown below. These results agreed with those reported for known compounds. Spectral and chromatographic characteristics of compounds isolated from Begonia flowers. The UV spectra of compound I obtained in this study were as follows: UV λ MeOH max (nm) 266, 365; + NaOH 277, 317, 413; +AlCl3 269, 351, 424; +AlCl3/HCl 269, 349, 424; + NaOAc 274, 483; +NaOAc/H3BO3 261, 365. The co-chromatography of this product with authentic standards showed the same Rf with kaempferol in the solvent systems 1, 2 and 3. Based on the above data, compound C1 was identified as Kaempferol. UV λ MeOH max (nm) 266, 365; + NaOH 277, 317, 413; +AlCl3 269, 351, 424; +AlCl3/HCl 269, 349, 424; + NaOAc 274, 483; +NaOAc/H3BO3 261, 365. All the properties of this compound were similar of those of the compound C1, except for its Rf which was different in the solvent system 1. This suggested that this aglycone was acylated. The kaempferol was liberated by alkaline hydrolysis but the phenolic acid has not been identified when subjected to co-chromatography with standards. The small amount of this compound was not sufficient to allow further analyzes. UV λ MeOH max (nm) 266, 349; + NaOH 274, 326, 401; +AlCl3 274, 303, 350, 394; +AlCl3/HCl 275, 303, 347, 396; + NaOAc 274, 304, 382; +NaOAc/H3BO3 268, 299, 359. The mean values of Rf in the system solvent 2 and 3 are similar to a monosaccharide derivative. The acid hydrolysis released kaempferol and glucose. Hence, this compound was characterized as Kaempferol 3-O-glucoside. UV λ MeOH max (nm) 266, 350; + NaOH 274, 327, 401; +AlCl3 274, 304, 352, 398; +AlCl3/HCl 274, 302, 349, 398; + NaOAc 274, 303, 388; +NaOAc/H3BO3 268, 362. It was characterized by an Rf similar to that of rutin in the solvent system which showed that it is a disaccharide. The acid hydrolysis of this compound released kaempferol, rhamnose and glucose. These data suggested that compound C4 was Kaempferol 3-O-glucosyl-rhamnoside. UV λ MeOH max (nm) 266, 349; + NaOH 281, 326, 402; +AlCl3 274, 304, 352, 399; +AlCl3/HCl 269, 302, 347, 397; + NaOAc 274, 305, 379; +NaOAc/H3BO3 268, 301, 359. It has the same chromatographic behavior in the solvent systems 2 and 3 to that of the compound 4, but different in the system 1. What suggests that it is an acylated kaempferol. The alkaline hydrolysis of C5 released kaempferol, rhamnose and glucose; but did not allow the identification of phenolic acid. The small amount of this compound was not sufficient to allow further analyzes. UV λ MeOH max (nm) 255, 302, 371; + NaOH 290, 326, 426; +AlCl3 271, 299, 349; +AlCl3/HCl 266, 262, 429; + NaOAc 274, 323, 386; +NaOAc/H3BO3 260, 388. These spectral data coincided with those of quercetin. It was characterized either by an Rf similar to the quercetin. The identified structure was Quercetin. UV λ MeOH max (nm) 256, 355; + NaOH 272, 330, 408; +AlCl3 274, 427; +AlCl3/HCl 269, 298, 360, 401; + NaOAc 273, 325, 389; +NaOAc/H3BO3 264, 301, 381. This product had mean values of the Rf in the solvent system 2 and 3, which are in favor of a monosaccharide derivative. Quercetin and glucose were obtained after acid hydrolysis of C7. Hence, this compound was identified as Quercetin 3-O-glucoside (isoquercitrin). UV λ MeOH max (nm) 257, 358; + NaOH 272, 329, 411; +AlCl3 273, 419; +AlCl3/HCl 263, 298, 366, 406; + NaOAc 273, 324, 406; +NaOAc/H3BO3 264, 384. These spectral data coincided with those of rutin. The co-chromatography of this compound with authentic standards showed similar Rf to that of the rutin in the solvent systems 1, 2 and 3. Quercetin, rhamnose and glucose were obtained by acid hydrolysis of C8. This allowed proposing the structure of Quercetin 3-O-glucosyl-rhamnoside (rutin). UV λ MeOH max (nm) 257, 268, 358; + NaOH 272, 368, 414; +AlCl3 273, 307, 427; +AlCl3/HCl 269, 301, 401; + NaOAc 273, 314, 380; +NaOAc/H3BO3 263, 313, 378. It was characterized by an Rf similar to that of Quercetin 3-O-glucoside in the solvent system 1 and 3, but did not migrate in the system 2. This is due to the presence of a phenolic acid. The resulting hydrolysates from the alkaline hydrolysis corresponded to quercetin, glucose and p-coumaric acid. This compound was identified as Quercetin 3-O-p-coumaroyl-glucoside. UV λ MeOH max (nm) 257, 266, 316, 360; + NaOH 271, 312, 373; +AlCl3 274, 301, 412; +AlCl3/HCl 273, 301, 400; + NaOAc 273, 314, 388; +NaOAc/H3BO3 263, 313, 378. It was characterized by a similar Rf to that of the rutin in the solvent system 3, but different in systems 1 and 2. This is due to the presence of a phenolic acid. The products resulting from the alkaline hydrolysis corresponded to quercetin, glucose and p-coumaric acid. Thus, the correspondent molecule was Quercetin 3-O-p-coumaroyl-diglucoside. Of these identified flavonols of Begonia flowers, quercetin, quercetin 3-O-rutinoside (rutin), quercetin 3-O-glucose (isoquercitrin) and kaempferol 3-O-glucoside were isolated from Begonia glabra and Begonia fagifolia,21,22 Begonia erytrophylla,23 Begonia formosana and Begonia fanic,24 and Begonia grandis.25 The other compounds are reported for the first time. The data provided by the conventional methods (chromatography and UV spectrometry) were supplemented by reversed-phase HPLC analysis. The optimized HPLC conditions led to a good separation of 25 peaks assigned based on their retention time Figure 1 and quantified in per cent by integration of their area. Eight of them were identified by comparing their retention time (Rt in mn) to that of the isolated compounds (C1-C10) characterized previously on the basis of their chromatographic and spectral properties. The peaks 9, 10, 14, 15, 19, 21, 22 and 25 corresponded respectively to quercetin 3-O-glucosyl-rhamnoside (Rt=23.5), quercetin 3-O-glucoside (Rt=25), kaempferol 3-O-glucosyl-rhamnoside and its acylated derivative (Rt=32), kaempferol 3-O-glucoside (Rt=33), quercétine 3-O p.coumaroyl-diglucoside (Rt=37), quercétine 3-O-P.coumaroyl-glucoside (Rt=40.5), quercetin (Rt=41.5), kaempferol and its acylated derivative (Rt=47). The remaining peaks are unidentified molecules which have not been isolated by preparative chromatography because of their low amounts. The Principal Component Analysis (PCA) analysis of HPLC data of 184 Begonia cultivars showed that the two principal components (F1 and F2) accounted for 68% of the total variance and was highly significant. As shown in Figure 2, of 25 variables analyzed, the main compounds contributing in varietal discrimination were glycosides (mono and diglycoside) of kaempferol and quercetin. In the first principal component F1 which explained 49% of the total variance was positively correlated with the variable 9 (quercetin 3-O-glucosyl-rhamnoside) and negatively correlated to variable 15 (Kaempferol 3-O-glycoside). However, the second principal component F2 (19% of the total variance) was positively correlated with variable 14 (kaempferol 3-O-glycosyl-rhamnoside) and negatively correlated with the variable 10 (quercetin 3-O-glycoside). The other flavonoids were not significant to contribute to varietal discrimination, due to their low content. HPLC chromatogram of extract of Begonia flowers. Q: quercetin, K: kaempferol. Principal Component Analysis of HPLC data of 184 of Begonia cultivars and score plot of 25 variables on the F1 x F2 factorial plane. Distribution of flavonoids composition data into 184 cultivars of Begonia. 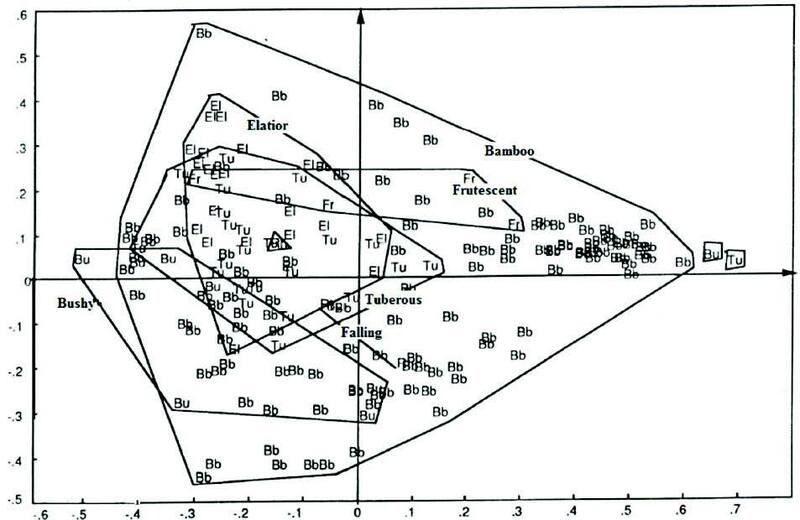 The Figure 3 illustrated the distribution of the cultivars of the different horticultural types based on their coordinates in the two-dimensional space and exhibited great flavonoid variability. As shown in the Figure 3, the bamboo Begonia varieties distributed on the right of axis 1 were characterized by high content of quercetin 3-O-glucosyl-rhamnoside and low level of Kaempferol 3-O-glycoside. The other varieties located in the neighbor of axis 2 were characterized by the presence of quercetin 3-O-glucosyl-rhamnoside (9) and kaempferol 3-O-glycosyl-rhamnoside (14) or quercetin 3-O-glucosyl-rhamnoside (9) and quercetin 3-O-glycoside (10). The varieties with higher contents of the Kaempferol 3-O-glycoside (15) were located in the negative part of the axis 2, and were differentiated by the presence of quercetin 3-O-glycoside (10) and kaempferol 3-O-glycosyl-rhamnoside (14). According to their flavonol profile, the varieties of this type could be divided into five clusters designated by chemotypes A, B, C, D and E characterized by their richness in compounds 9 and 15, 9 and 14, 9 and 10, 15 and 14 or 15 and 10 respectively. - The data obtained with the elatior and tuberous types are superposed. This is in agreement with the hypothesis that elatior varieties originate from a cross between tuberous hybrids.26 The varieties of Begonia elatior were clustered along the axis 2 and those of the tuberous type along the axis 1. 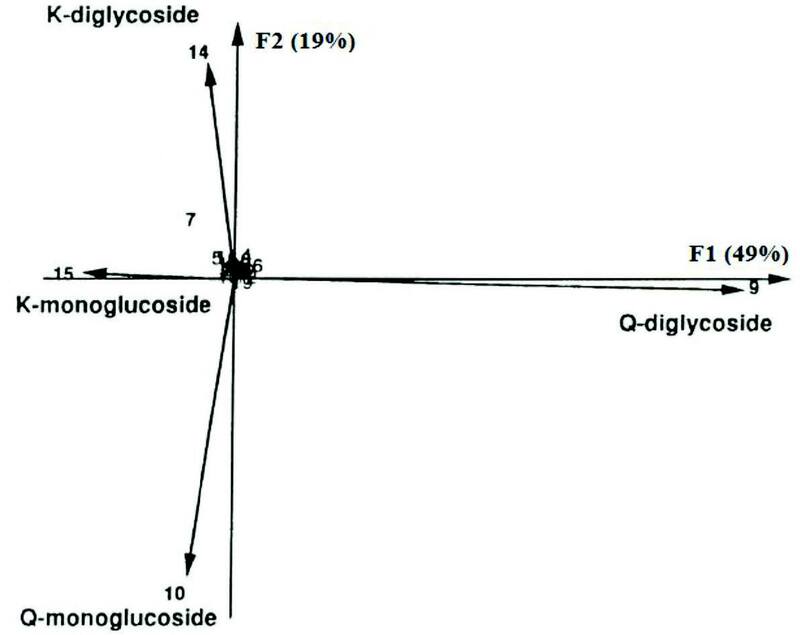 On the negative part of these two axes, the cultivars of these horticultural types were characterized by the presence of kaempferol derivatives (14 and 15); and those distributed on the positive part of axis 1 possessed high level of quercetin 3-O-glucosyl-rhamnoside (9) and glycoside 10 or 14. The unidentified compound 7 was specific to elatior and tuberous types, which differentiate them from the other horticultural types. Although, these two types are morphologically different, they possess complementary biosynthetic pathways of the heterosides 9 and 14 (chemotype B), 9 and 10 (chemotype C) or 15 and 14 (chemotype D). - The frutescent cultivars are homogeneous and are rich exclusively in heterosides 9 and 14 (chemotype B). This differentiated them from varieties of the bushy type characterized by high contents of glycosides 9 and 10 (chemotype C) or 15 and 10 (chemotype D). - The rhizomatous type has two major glycosides 9 and 10 (chemotype D). The phytochemical study of flavonoids Begonia flowers showed that the main components were determined as flavonol type corresponding to quercetin and kaempferol aglycones or glycosides (mono and diglycoside), acylated and non-acylated components. The acyl was identified as a p-coumaric acid. Among these flavonols, 6 molecules are reported for the first time in this genus. On the other hand, the evaluation of the flavonol composition by reversed-phase HPLC showed a significant variation of flavonoid content between different types of Begonia. The Principal Component Analysis (PCA) of HPLC data indicated that the non-acylated glycoside of quercetin and kaempferol summarize the essential flavonoid variability which is also important within the cultivars of the same type as between distinct types. This heterogeneity is due to an antagonism between the glycosides (mono and diglycoside) of quercetin and kaempferol, resulting probably from different processes that regulate their metabolic pathways. Hence, the genus Begonia is very heterogeneous and it is possible to distinguish several chemotypes whose differences rely on the complementarities between the metabolic pathways involved in the biosynthesis of glycosides of quercetin and kaempferol. The phenolic profiles of different varieties of Begonia could be used to create new cultivars by breeding, mutation or genetic engineering to modify flower color as reported for chrysanthemum,27 petunia 28 and gerbera.29 In addition to their decorative value, cultivars which contained the highest amounts of quercetin and kaempferol glycosides could be selected as potential pharmaceutical resources. The authors gratefully acknowledge Pr Maurice Jay and the whole team of the Laboratory of Phytochemistry at University Claude Bernard Lyon I, for providing the necessary research facilities to carry on this study. Conflicts of interest CONFLICT OF INTERESTThe authors have no conflict of interest. Tanaka Y, Sasaki N, Ohmiya A. Biosynthesis of plant pigments: anthocyanins, betalains and carotenoids. Dr Saffidine Karima: Department of Medicine, Faculty of Medicine, University Ferhat Abbas Setif1, Algeria. Prof. Benayache Fadila:Molécules Bioactives, Analyses Physicochimiques et Biologiques (VARENBIOMOL), University Frères Mentouri – Constantine, Algeria. Prof. Jay Maurice: he was professor head of Laboratory of phytochemistry, University Claude Bernard-Lyon I, Villeurbane, France. Actually, he is Vice-President Europe at World Federation of Rose Societies (WFRS). Dr. Chirol Nadine: Laboratory of phytochemistry, University Claude Bernard-Lyon I, Villeurbane, France.